2016 was a stellar year for the U.S. solar power industry. The market doubled from the previous year and solar added more electric generating capacity than any other type of energy. This was a first and a sign of what is to come. Experts predict the U.S. solar market will triple within the next five years. The non-residential market is also expected to have growth of 11 percent. The increase is attributed to many factors, including lower prices and expanded installations throughout the U.S. A surge in utility-scale projects is also a contributing factor to the solar market boom. Nevada is one state with a growing solar market. The state ranks fourth in the nation when it comes to solar job creation and installed capacity. Ten percent of the state’s electricity is from solar power while nearly a half-a-million homes are powered by solar. Even the bright city of Las Vegas is quickly becoming one of the top solar cities in the U.S. Going solar involves research. Just how much of a savings solar will be is easily calculated using a solar calculator. Simply enter your address and choose a property type: residential, commercial, or non-profit. Include the amount of your average monthly electric bill. By clicking the calculate button, you will receive an estimate based on your roof, electric bill, and actual offers in your area. This is a great way to start your solar market research. The average cost of a solar system in Las Vegas is $16,750, before rebates and incentives. It is important to note that Las Vegas homeowners received quotes citing savings of over $26,000 during the course of 20 years. The upfront costs are an investment into a system that provides a strong ROI. NV Utility, Nevada’s lead utility, offers a rebate of $0.15 per watt of solar energy installed. This can equate to one thousand dollars or more. The true amount of the rebate depends on the size of the system. Low-income homeowners may qualify for an additional rebate depending upon their income bracket. 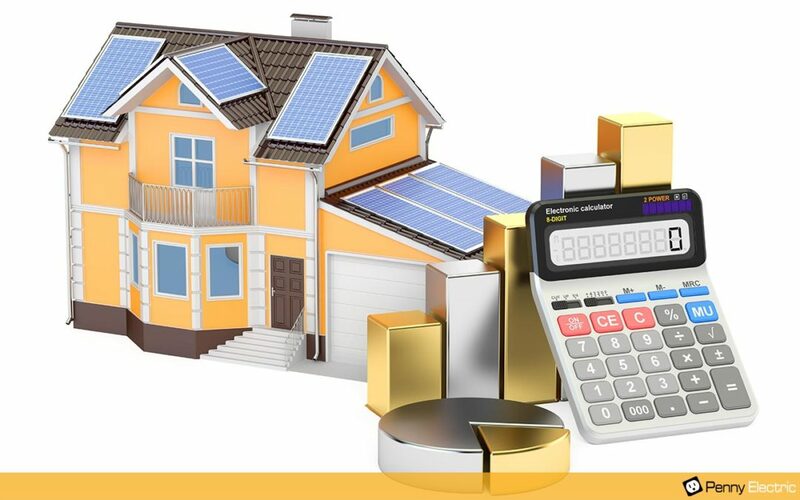 By registering your property on Solar Marketplace, you can save additional money. If you receive 3 or more quotes, you may save as much as $2,000 on solar panel installation. As with any large purchase, bigger isn’t always better. A report by the U.S. government found that larger solar companies charge upwards of $5,000 more than smaller, local companies. Deciding which solar package is right for you takes careful consideration. Larger companies often present fewer options. Choosing the right solar panels for your home might mean choosing a less expensive package. Higher priced panels don’t always mean better. Different sizes and types of panels exist for different structures. Here at Penny Electric, we have experienced and highly skilled staff who can assist with installing the infrastructure for your new solar system. A free, no obligation quote is quick and easy. Simply click here to complete the online form. Upon receipt of the completed form, a company representative will contact you with pricing, service, and scheduling options. Now is a great time to start thinking about going solar. For the first time ever, it was the top source of new power capacity in 2016. Experts forecast an upward trend for the solar market. Start the process by using the solar calculator to estimate your savings. Decide which incentives you qualify for and what equipment options are the best choices for your home. Taking these first steps will lead to long-term savings in the future. We’re proud to be a part of this exciting new future for Nevada power. Let us help you go solar; contact us today.